Heat a large skillet over medium-high heat. Place one tortilla at a time in skillet and heat 30 seconds on each side to create slight char marks. Remove from skillet and set aside on a plate. Place chorizo in hot skillet and cook, stirring often, until browned, about 10 minutes. Remove from heat and set aside on a plate or in a heatproof bowl. In a medium bowl, whisk together eggs with 1 tablespoon water and taco seasoning. Heat a separate medium skillet over medium-low heat; add eggs and stir until fully cooked and scrambled. Remove from heat and set aside on a plate or in a heatproof bowl. Arrange taco shells on a plate. Fill evenly with chorizo, then eggs. Top with salsa, bell pepper, cilantro and red onion to create a rainbow effect. Serve warm. If I could invent a game show, I’d make one called “Taco Time,” where contestants would be given unlimited amounts of yummy mystery tacos and they’d have to eat as many as they could before the buzzer went off. And THEN, dollar bills with pictures of presidents eating tacos would fall from the ceiling and the winner would receive a lifetime supply of tasty tacos. Obviously, I have way too much time on my hands. Luckily, we don’t need a game show to get our hands on these super easy, super delicious Chorizo-Egg Rainbow Tacos. You also don’t need much time to guess what all the ingredients are, because they are right there in plain sight, rainbow-style, for your own two purdy eyes to see. 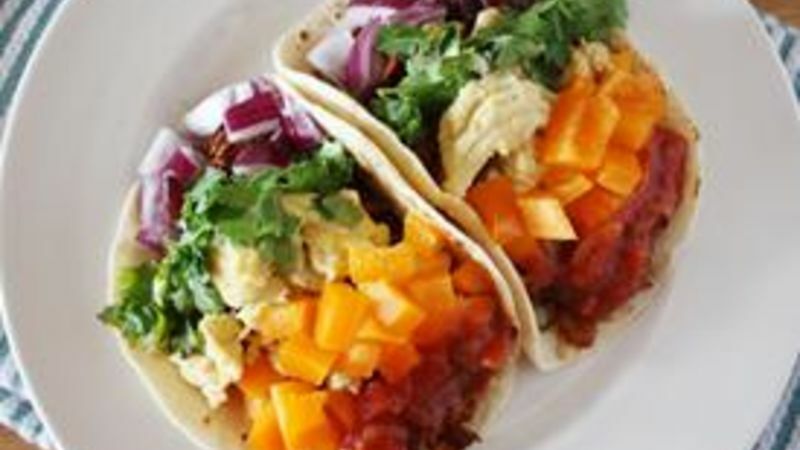 Thanks to fresh produce and the winning combination that is spicy chorizo and scrambled eggs (mixed with Old El Paso’s taco seasoning, YUM), this recipe is perfect for breakfast, lunch, dinner, or any time you want a taco in two shakes, a.k.a. less than a half-hour. Ladies and gentlemen, it’s taaaaaacccooooooooo tiiiiiiiime! Gather your ingredientes. You’ll need a whole lotta eggs, some chorizo, Old El Paso soft taco tortillas, salsa, a bell pepper, cilantro and red onion. Break the eggs into a large bowl and add a dash of water and a bit of Old El Paso taco seasoning. Whisk it all together and set aside. Meanwhile, heat a large skillet over medium-high heat and cook tortillas on each side for about 30 seconds to create a slight char for extra flavah. Remove the tortillas from the skillet and place the chorizo, removed from the casing and crumbled, into the skillet. Cook until brown. Meanwhile, scramble the eggs in a separate medium skillet over medium-low heat. Now that you’ve got everything prepped, it’s time to make the taaaaaaaccccooooooooooos! Scoop some chorizo in the bottom of each taco, then top with egg. Garnish with salsa, bell pepper, cilantro and red onion in a “rainbow”-like fashion (leave a space for the yellow egg). That’s all it takes to make a tasty taco. Now you can use all that leftover free time to make up your own game show! Or not.